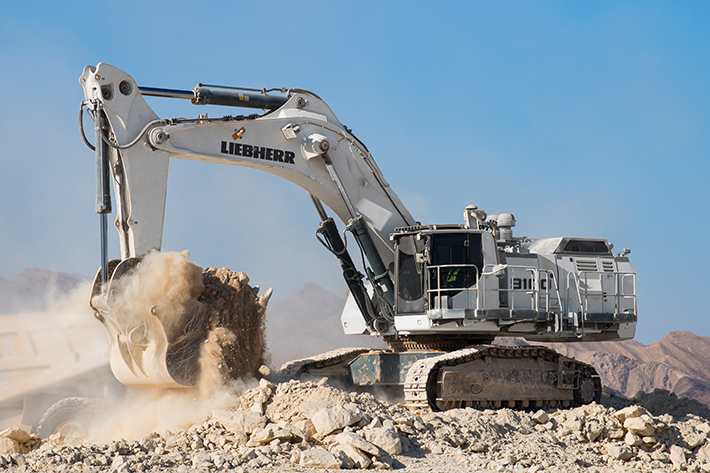 The R 9100 (first launched in 2010) and R 9150 (first launched in 2012) are based on 60 years of Liebherr experience in the development and construction of hydraulic excavators. Innovative technologies from the manufacturer’s large hydraulic excavator programme, together with well-proven components, make these updated models ideal for the mining and construction industry’s needs. The D9512 diesel engine is the latest generation of Liebherr diesel engines and is now USA/EPA Tier 4f compliant. It has been upgraded on many levels with an increased engine lifetime (SMU target of 15,000 hours) and new features that facilitate and improve the engine maintenance. Furthermore, the new B-versions come with the exclusive EVO Bucket Solution to maximise the loading capacity and ensure optimal penetration efficiency. Thanks to the contoured sidewalls and the augmented depth, the EVO Bucket backhoe bucket has now a capacity* of 7.5 m³ (9.8 yd³) for the R 9100 B and 8.8 m³ - 9.6 m³ (11.5 - 12.6 yd³) for the R 9150 B (*for a material density of 1.8 t/m³). The new buckets also make both excavators the perfect working partners in terms of shovel match for the Liebherr T 236 truck and all other articulated and rigid trucks in the 50 t to 100 t class.